If you’ve never watched the movie The Princess Bride or read the book, the bad news is that the story below isn’t going to make a lot of sense. The good news is that you now have some extra time to find a copy of the book or movie and start watching or reading it, and you’ll enjoy that experience more than today’s Now I Know anyway. That’s not a knock on the story below, but rather on how fantastic of a story The Princess Bride is. And as good as the movie is — and it’s great! — the book is still somehow much better, so, start there. It’s worth the investment of $10 and eight to ten hours of reading. Perhaps because of Reiner’s love of the story, the movie is very true to the book, perhaps inconceivably so. Yes, there are deviations and omissions, but compared to most other novel-to-movie adaptations, The Princess Bride follows the book quite well. For example, Peter Falk’s character — the grandfather who is reading the book to his sick grandson (played by Fred Savage) — echoes the role of William Goldman, the author of the book. Throughout the novel, Goldman pretends that the novel you’re reading is actually an edited-down version originally written by a guy named S. Morgenstern. To further the ruse, Goldman spends a significant amount of words addressing the reader directly, often commenting on Morgenstern’s style. For example, chapter four is only one page long, and that page is simply Goldman telling the reader that Morgenstern outlined the preparation for Buttercup’s and Humperdink’s wedding in excruciating detail — an experience to which we are not being subjected due to Goldman’s edits. And that brings us to the delete scene — the important one, that is. It’s an aside toward the end of chapter five. No, there is too much. Let me sum up. Westley and Buttercup had just reconnected at the hill atop the ravine, the scene cuts to Humperdink and Rugen coming across the dead Vizzini, and Humperdink correctly believes that our hero and the princess are on their way into the Fire Swamp. At that point, “Morgenstern” decides to cut directly back to Westley and Buttercup entering the Fire Swamp, much to the chagrin of his wife. (Yes, the fake Morgernstern also addresses the reader directly.) Mrs. Morgernstern wanted her husband to tell the story of the obviously romantic reunion between Westley and Buttercup, but the author that didn’t exist decided not to. Goldman, at this point, interjects. 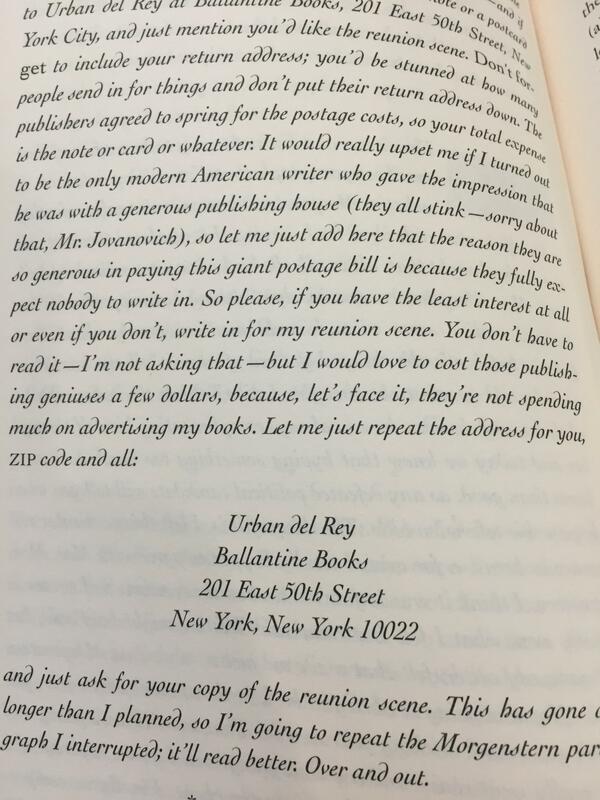 What can be told is that the first version of Goldman’s response to his readers was a three-page story about a lawsuit between Mr. Shog, a representative from the estate of S. Morgenstern, and publisher William Jovanovich preventing the publication of the reunion scene until early 1978. The full letters can be read here (scroll down a bit), if you’re interested. One day, perhaps NASA and Florin will allow for the scene to be released, but really, it would take a miracle. Bonus Fact: The man who choreographed Westley’s and Inigo’s sword fight atop the Cliffs of Insanity was a fencer named Bob Anderson. Anderson, who passed away in 2012, was also the sword master (that’s what he’s credited as) on the Lord of the Rings movies (he trained Viggo Mortensen and others) and was the stunt double for Darth Vader in both the Empire Strikes Back and Return of the Jedi. He was not left-handed. From the Archives: Worthy of Gryffindor: A very touching easter egg in the Harry Potter world. Take the Quiz: Finish the quote from The Princess Bride. You need the exact wording, making this much harder than it seems, and it doesn’t have my favorite quote either. (“We are both men of action; lies do not become us.”) But it’s still a good quiz. Related: “The Princess Bride,” the mass-market paperback. The reunion scene isn’t on page 194-195. Five stars on an million reviews, or something like that.